Quality: Plain Silk Fabric (60 GSM). 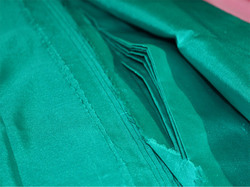 We offer to our clients a wide selection of high quality Cotton Silk Blended Fabric. This Cotton Silk Blended Fabric is one of the most utilized fabrics all across the world today. Its various types of usage make it an inevitable fabric of the garment industry. We provide this perfect blend of cotton with silk fabric in various forms and counts in a wide range of gsm. We hold expertise in offering vast variety of Silk Cotton Blended Fabrics, which is fabricated using excellent quality silk and cotton that is sourced from trustworthy vendors of the market. These are praised by our national and international clients for superior quality, softness, reliability, high luster and durability. Cotton blended silk is the strongest of all natural fabrics and is famous for its shine and luster. A wide array of silk fabrics is used for producing garments and home furnishing items. Consecutively to impart an enhanced look and to ensure improved durability, silk is often blended with other natural fabrics such as cotton. Silk blend are used in dressies Outfits.